F5860H is a four port UHF RFID fixed reader, which embeds the M2240 module. 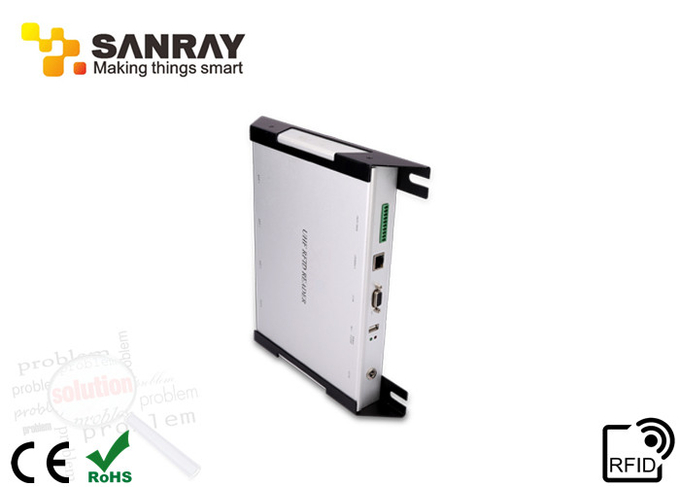 Its communication interfaces can be USB, RS485, RS232, and 100M Ethernet, etc.. It has four TNC antennae interfaces, with a protection level of IP64. Aluminium alloy of the whole body makes this reader more rugged and durable as well as the excellent heat dissipation capability, antijamming capability and lightning-proof ability. F5860H is suitable for RFID intensive and more challenging environment and required a higher reading/writing performance, such as warehousing, logistics, production line management, etc..
1: Employed IMPINJ R2000 RF Chips, up to -82dbm receiving sensitivity and the highest performance in this field make this module more suitable for harsh application environment. 2: Remarkable performance, can achieve a reading distance over 8m for single tag reading with 8dbi RF antenna. 3: Remarkable performance in intensive taps reading can attain a tags identification rate of 400tags/s. 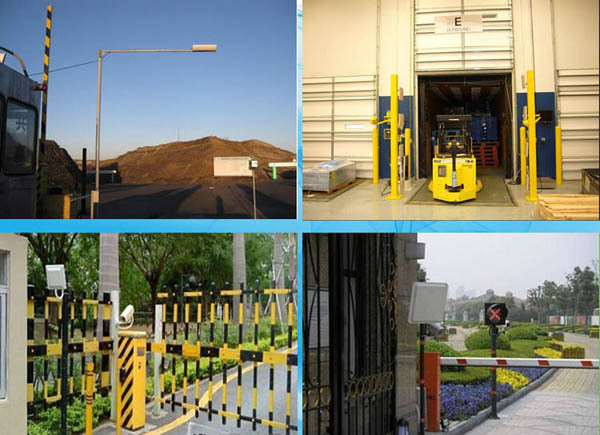 4: Provide the most comprehensive functions SDK and ports, easy to integrate RFID software. 5: Adopted integrating RF chip, module performance is more stable, and more suitable for harsh application environment. 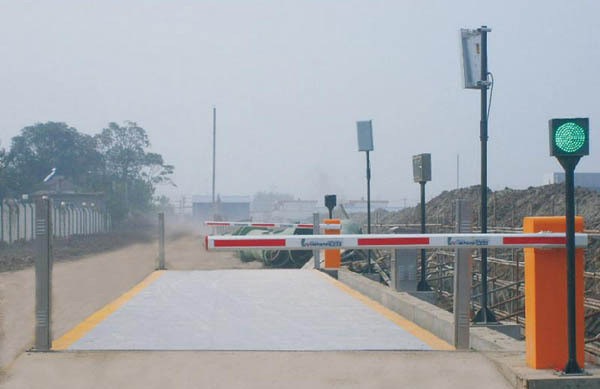 6: The use of carrier wave cancellation technology makes the tags reading more accurate and reading scope wider. 7: Provide four TNC antennae interfaces, users can achieve superior reading performance with less equipment deployment. 8: Enhanced noise suppression function for reliable data capturing. 9: High precision return signal strength (RSSI). 10: Excellent performance of anti-interference and lightning-proof design. 11: Aluninium alloy enclosure, rugged and durable, remarkable performance of heat dissipation. 12: Aesthetic appearance, easy to install. A:Yes.We are of course manufacturer with our own R&D team and factory in shenzhen. 2. Q:Can you provide application software for the hardware? A:We provide free SDK and User manual of all API to support your development or programming. 3. Q:What is the warranty? A:The warranty time is 1 year without man-made damage. 3. Q:Does the device have the language default as English? A:Of course, our device supports multi-language such as English,Spanish, Portuguese ,French, German,Polish,Japanese, Russian and so on. 4. Q:Can your device install the Android Apps that our customers provide? A:No problem. Just send us your Apps which you need to get the liscense of the apps and then our Engineers can do that for you. If you have any other question about our products,please don’t hesitate to contact us.We will be more than happy to serve you. 2. Professional manufacture.Welcome to visit our website:www.cmrfid.com. 4. High quality,fashion designs,reasonable & competitive price,fast lead time. 1). All products will have been strictly Quality Checked in house before packing. 2). All products will be packed for shipping. 6. Faster delivery:5-12days for bulk production. 7. Payment:You can pay for the order via:T/T,L/C,Western Union. We have strong cooperation with DHL,TNT,UPS,FEDEX,EMS,China Air Post. 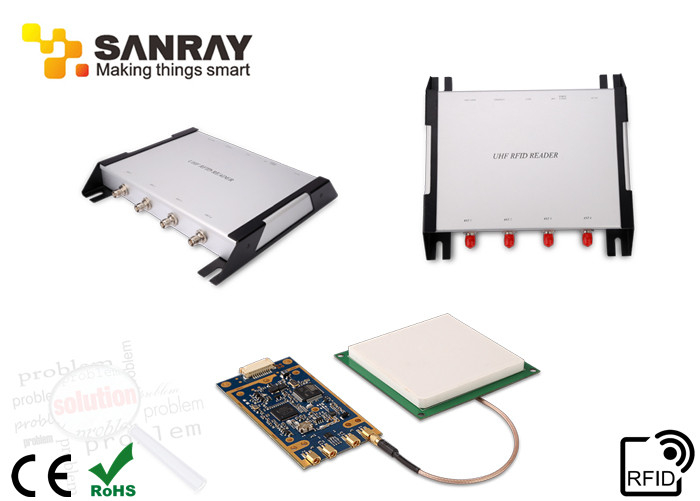 Shenzhen Sanray Technology Co., Ltd. is a high-tech enterprise specializing in the development, manufacture and sales of to quality UHF RFID products and active RFID products. We focus on the development and sales of UHF RFID modules, readers and tags, and 2.45GHz RFID readers, tags, etc. We spare no efforts on the supply of RFID products with various functions and high reliability to our cooperation partners. Also we provide the clients in fields of libraries, financial units, mass production and logistics with comprehensive intelligentized solutions.